FADA Radio & Electric Co. This radio is one of the most famous designs of the 1930s American 'Golden Age of Radio Design', an era which began around 1930 stimulated by the slowing down of developments in radio technology. This, combined with the dire economic effect of the Great Depression on home budgets, meant that radio manufacturers had to focus on updating the design of radio cases to create an impression of high-tech modernity. 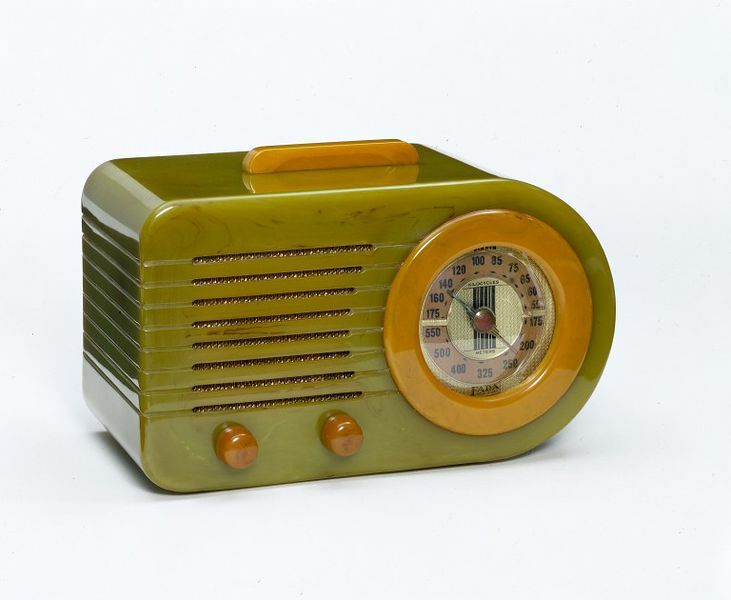 Many turned to plastics, which could be mass-produced industrially (therefore making them cheaper to manufacture), and which gave many plastic radios a self-consciously 'modern' appearance. The 'streamlined' style of many American radios of the 1930s took inspiration from contemporary American cars, another luxury commodity which was then becoming more affordable. The set is made from a plastic known generally as Catalin, it was first produced in 1927 by the American Catalin Corporation. Catalin is actually a variant of phenol formaldehyde (Bakelite) made without fillers. The strength of Bakelite stemmed from the fillers used (commonly wood flour) in its composition. However, using fillers limited Bakelite's potentially vast range of colours to only dark ones, like black or brown, as dark pigments helped to conceal the fillers which would otherwise have been visible. Catalin dispensed with fillers and was cast rather than compression-moulded, then hand-finished by skilled workers. Catalin, once hardened, had an attractive translucent, marbled lustre. 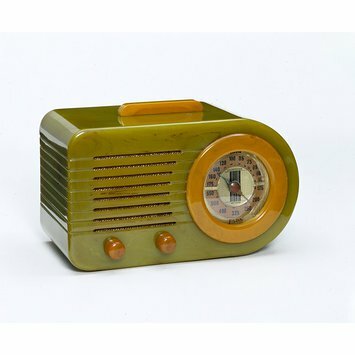 The two-stage production process made Catalin radios more expensive than Bakelite ones, which meant their production was not feasible after America's entry into the Second World War. This model was produced for only a short time, in 1940, and consequently it was made in only limited numbers. An updated version featuring redesigned control knobs was introduced in 1945. Tabletop radio set constructed from cast marbled onyx Catalin, trimmed with yellow Catalin. The proper left side of the radio is rounded, enclosing a circular, rotary, 'airplane'-style tuning dial. Below the speaker grille, on the proper left of the set, are two 'gumdrop' control knobs. On top of the set is a retractable sprung yellow handle. Purchased by the V&A in 1992 from Gad Sassower [92/1312]. On entry to the Museum the condition of this radio was recorded as 'sound'. The first successful radio transmission was made by David Edward Hughes (1831-1900) in 1879. Some years later, in 1896, Gugliemo Marconi (1874-1937) patented a system of electromagnetic radio wave communication which, unlike the already-established telegraph system, was ‘wireless’, meaning signals could be heard by anyone with a radio receiver in range of the broadcast. Marconi established the world’s first radio factory in Chelmsford in 1898, where sets were hand-built to high specifications for mostly scientific, governmental and military customers. Another early customer was Queen Victoria who in 1898 had a set installed at Osborne House, Isle of Wight, so she could communicate with the Prince of Wales, the future Edward VII, as he convalesced aboard his yacht at Cowes. Military applications meant that radio technology advanced rapidly during the First World War, and in the 1920s regular civilian broadcasting began, changing the domestic experience forever. The previously diverse parts of the radio; the valves, controls, wires and speakers, began in the mid-1920s to be enclosed inside a single cabinet. In this early period, radios were seen essentially as furniture and some companies employed cabinet-makers and well-known furniture designers. As radios were new to the domestic interior, their design had no precedent, which allowed manufacturers to design them creatively. This struck a chord in the late-1920s and 1930s with the expanding synthetic plastics industry; oil-based plastics were also a recent innovation, the first, Bakelite (phenol-formaldehyde), having been successfully synthesised in 1907. The collaboration between industrial designers and manufacturers gave rise to many very modern radio designs, particularly in America. Tastes in Britain remained, in general, more conservative, favouring wooden cabinets or Bakelite cabinets imitating wood. During the Second World War the manufacture of civilian radios essentially ceased in the United Kingdom, with the exception of the ‘Utility’ radio (see V&A CIRC.678-1975) produced under government directive by 42 companies. FADA Radio and Electric Co. was founded in 1920, in Long Island, New York, by Frank Angelo D’Andrea, who used his initials for the company name. FADA grew rapidly in their first few years, renting three factory spaces in the Bronx by 1921-22. Weakened in the mid-late 1920s by employee strikes and loss of several senior staff, D’Andrea sold the company to a group of Boston investors in 1932. It was bankrupt by 1934, but was revived by a group of New York businessmen and went on to produce, in the late-1930s and early-1940s, several iconic radio designs, emblematic of the American golden age of radio. New, this set would have cost $23. Catalin is a casting resin similar in composition to Bakelite but translucent. Its production in a wider colour range than Bakelite made it popular for casings for the American market. This was the first Fada model to feature an integrally cast speaker grille and the drop-handle, later widely imitated. Catalin was first available in 1927, it is a variation on the usual recipe for phenol formaldehyde resin, better known as Bakelite. Bakelite's strength comes from the use of fillers, such as wood flour, in its production. Bakelite could in theory be any colour, depending whether pigments were added during its production, but dark colours were favoured because they concealed the fillers. Catalin, a liquid resin, dispensed with fillers, which allowed a dramatically expanded range of colours. Catalin products were cast, hand-finished, and assembled. Its two-stage production and luxury, transparent finish meant that it Catalin products tended to be expensive. After 1940, it became unfeasible to manufacture Catalin products in any quantity, and the 'Golden Age of radio design' came to an end.